Whispers in the Loggia: ...And Bradley Makes "Sixburgh"
The Steel City'll weep today: the Pope has named Bishop Paul Bradley, the beloved auxiliary of Pittsburgh, to lead the diocese of Kalamazoo. 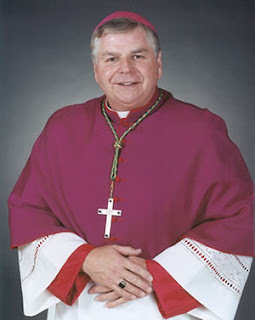 At the helm of the Michigan church of 110,000, the 63 year-old prelate succeeds Bishop James Murray, who reached the retirement age of 75 in July 2007. A veteran pastor named vicar-general to then-Bishop Donald Wuerl in 2003 and his auxiliary two years later, Bradley scored high marks for his 17-month stint as administrator of the 850,000-member Pittsburgh church between Wuerl's 2006 appointment to Washington and Bishop David Zubik's 2007 homecoming, when a prolonged, priest-led standing ovation for the auxiliary brought him to tears. Coming from the home of the six-time Super Bowl champions, today's appointment -- the first Holy Week nod the Stateside church has seen in memory -- brings the number of 'Burghers leading US dioceses to six. With the move, the Steeler diocese has lost its lone auxiliary. A social worker by training who's still very much a parish priest at heart, Bradley's installation in Derek Jeter's hometown has been set for 5 June. Peace be with you! With that joyful and hope-filled greeting of Jesus to His apostles, and of the successors of the apostles, the bishops, to their faithful people, I greet you, the priests, religious and laity of the Diocese of Kalamazoo, my new family of faith. First of all, I want to give thanks and praise to our loving God – Father, Son and Holy Spirit – for all blessings you and I have received, especially the gift of our Catholic faith. Secondly, I want to express my deep gratitude to our Holy Father, Pope Benedict XVI, for the trust he has placed in me by appointing me as the Bishop of Kalamazoo. I am both humbled and excited by this great opportunity to serve the Church as your shepherd. I also want to express my deep admiration to Bishop James Murray who has served you so well for the past 11 years as a gentle and loving shepherd. I am very pleased to know that Bishop Murray will continue to serve you until the day of my installation as the 4th Bishop of Kalamazoo on June 5th. I look forward to learning so much from him during this time of transition. My Episcopal motto is “Waiting in Joyful Hope.” It refers to the faith-filled stance of the Church, active and alive in the world, even as we anticipate what awaits us beyond this world. I will personally be waiting in joyful hope as I eagerly anticipate serving you in the spirit of Christ and beginning our pilgrimage of faith together. Until that day, I promise to hold you close to my heart in prayer, particularly during this Holy Week. Please pray for me as well at this holiest time of the year. Finally, I place myself and my ministry into the loving and gentle hands of our Blessed Mother. I ask her, along with Saint Augustine, Bishop and Patron of the Diocese of Kalamazoo, to intercede for us, asking our loving God to extend His bountiful blessings upon all of us. We celebrate with the faithful of the Diocese of Kalamazoo who will be blessed with Bishop Bradley’s ministry. At the same time, we realize that we are losing an adviser, a leader, a spiritual mentor and a friend who has served the Church of Pittsburgh so well since his ordination as a priest nearly 38 years ago. When I came back to the Diocese of Pittsburgh from Green Bay, I knew that I would have Bishop Bradley as a co-worker and a friend. In my first press conference and at my Mass of installation, I praised what Bishop Bradley had accomplished in his 15 months as Administrator of the Diocese. I also assured all of you that he would continue at my side, assisting me in administering the Diocese of Pittsburgh. And so he has, and very clearly with a Shepherd’s heart. Bishop Bradley and I have spent these nearly two years working, praying and ministering together. To know that he will no longer be with me where I can benefit daily from his wisdom, strength, friendship and love for Jesus is the “bitter” part of this moment. I will deeply miss Bishop Bradley, as will the staff of Pastoral Administration and the clergy, religious and laity who have been extraordinarily blessed to have worked with him. At the same time, we are overwhelmed with the “sweet” knowledge that the Diocese of Kalamazoo and its clergy, Religious and faithful, will have a true Shepherd in Bishop Bradley. As the Holy Father recognizes in this appointment, the Church universal is blessed to have a man of Bishop Bradley’s strength and faith serving in apostolic ministry. As previously noted, tomorrow night Zubik will preside at a much-publicized Service of Apology in St Paul's Cathedral, intended to seek the forgiveness of anyone who's felt hurt by the church in any way.